As an illustrious corporation of the industry, we are eagerly immersed in presenting a broad gamut of Semi Automatic MIG Welding Machine to our patrons. We are assisted by a crew of experienced personnel who are enormously indulged in bringing forth a broad gamut of Arc Equipment. 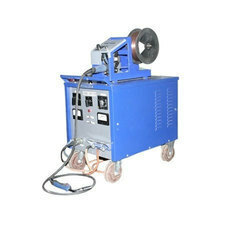 We are specialized in offering Electric MIG Welding Machine to our customers. Our presented product is extremely used in the market owing to their top features. Offered by us is an exclusive range of MIG Welding Machine to the esteemed customers, as per their specific needs. These machines are used for fixing different types of objects. Moreover, these products can be mounted on a suitable surface. With new arc series of robots‚ Rhythmsoft can now offer you a cost – effective alternative in the highly competitive arc welding market. We are offering MIG & MAG Welding Equipment to our client. Appreciated for its easy use, high penetration, excellent productivity and automatic waste removal, these are highly demanded among the customers. Also, depending on the various parameters employed, these are customized according to the clients specifications detailed. 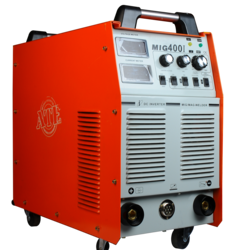 We are a renowned Manufacturer and Supplier of 300 Amp 400Amp MIG Welding Machine in Nashik. . The Welding Machine, provided by us, is designed at low cost far lower than conventional machine.